Ruffles and Rouge: Butter Me Up! Every now and then you stumble onto a product and you wonder - why did I not pick this up ages ago??!! I think I have cruised the hair-care aisle enough that I should think about part-time employment. And yet - I never saw this product until last week. 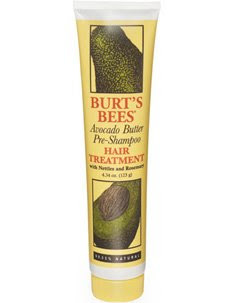 I'm talking about the Burt's bees avacado butter hair treatment. I am obsessed with their lip balm so when I stopped by the display I was suprised that I hadn't tried their hair treatment so I picked it up last week and I ABSOLUTLEY love this stuff! How I Use It:I wet my hair and put it on my scalp and all thru my hair at the start of my shower and rinsed it off about 20 mins later (gave me the perfect time to do a body scrub btw) and my hair felt so soft. Similar to the affect I get with vatika hair oil - but with an easier application! So if you are on the market for a hair masque give this one a try - It's under $8.00 !! Let me know how she likes it.. I heart burt's bees !